What could be more satisfying than a journey from the Atlantic coast to the Mediterranean? But it takes at least 50 days of walking (unless you are very fit and a racing type), so we are developing a whole range of coast-to-coast holidays that are both possible and enjoyable lasting one week, two weeks, one month, and the whole caboodle (five fortnights perhaps spread over five years). 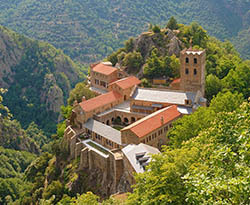 Soon you will be able to take your pick, but we have begun with a two week itinerary (The Best Of The Pyrenees Coast-to-Coast In 2 Weeks), which, as its name suggests, does indeed include most of the highlights, and some magical walking. Inevitably, it includes daily private transfers and these put the cost up, but we promise you it will be worth it !